As you all know, the Reserve Bank Of India (RBI) has barred all crypto related businesses from using the national banking services. As expected, it has severely hampered the growth of cryptos and the blockchain industry in India. Crypto related investments, in particular, have faced the wrath of the government decisions. So what exactly is happening in India? Well, the exchange volumes have dropped significantly, and exchanges are either shutting down, changing their business model or moving out of the country. However, some exchanges have decided to stay put and peacefully fight the ban by resorting to P2P exchange model like LocalBitcoins. For those who are unaware, LocalBitcoins is an exchange where peers can discover each other and buy/sell cryptocurrencies. Crypto to crypto P2P transactions are easy to facilitate, but the problem arises when one needs to deposit or withdraw the money (in INR). One of the newest exchanges in India, Bitbns, has come up with an innovative INR on-and-off-ramp mechanism which we are going to discuss in this post. Log into Bitbns and click on ‘Add Money to Wallet’ and enter the amount you want to deposit. 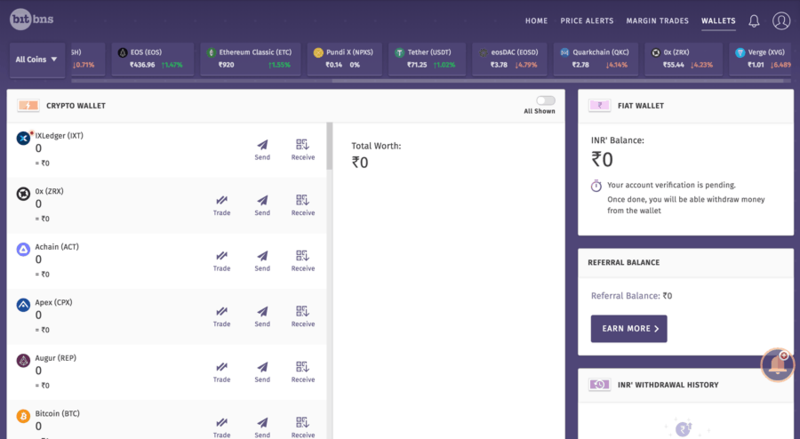 Bitbns’ peer-to-peer match engine will find a person who has placed a withdrawal request. Once done, note down the withdrawer’s email ID. Log in to your BidforX account. Go to the Vouchers section. Enter the amount you want to deposit, enter the email ID of the withdrawer, and click on ‘Generate Now’. Copy the voucher code, go back to the deposit section on your Bitbns account, click on ‘Submit Voucher Code’ and paste the voucher code. Upon submitting, you will get a pending status on your Bitbns account. Your deposit process completes when the withdrawer confirms that he/she has received the voucher. 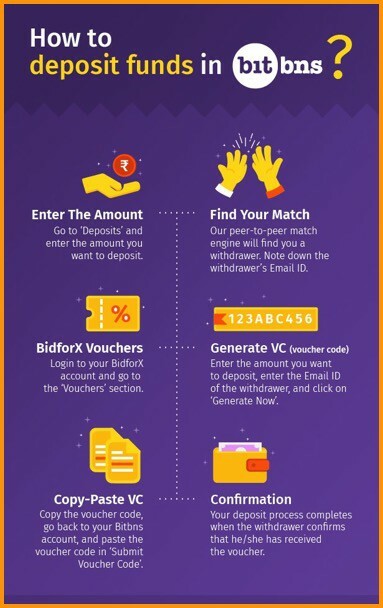 Log into Bitbns and click on ‘Withdraw Money’ and enter the amount you want to withdraw. Enter the OTP in ‘Authenticator OTP’ section and click ‘Next’. Login to your BidforX account and go to the ‘Vouchers’ section. Verify the amount you received in BidforX, Raise dispute if the amount doesn’t match or incorrect voucher code. Go to ‘Profile’ on BidforX and click on ‘Withdraw’ to receive an amount in the bank. Let see how you can deposit money (INR) in Bitbns. Initiate deposit request by going to the wallet and Select on “Deposit”. Then choose the banking payment method ‘UPI/NEFT’. Enter the amount you wish to deposit and click on ‘NEXT’ to complete the initiation process. Once a deposit request is initiated, the user will get a list of peers to whom the transfers have to be made. You will get the bank account details of the withdrawer, and you need to transfer them money through your chosen UPI/NEFT method within a timeframe. You also need to put the reference number of your transaction in Bitbns account after you complete your transaction. Your deposit process will be complete when the withdrawer or receiver confirms receipt of funds on the Bitbns platform, following which the balance will be credited in the Bitbns wallet. 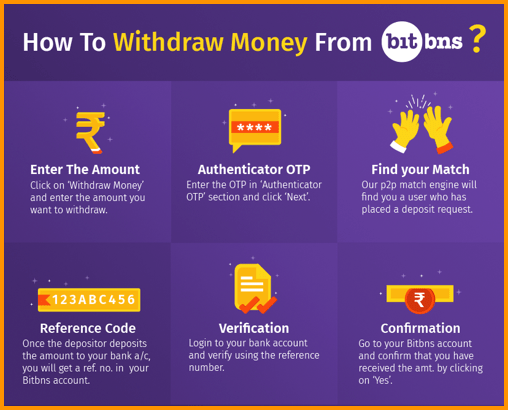 Now let’s see how you can withdraw money (INR) from Bitbns. Go to the wallet and click on “Withdraw”. 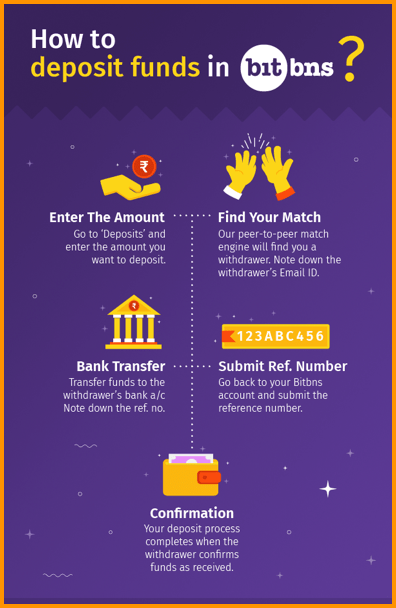 Choose the method as Bank Transfer using UPI/IMPS. Enter the amount according to the new deposit structure as specified below. Enter the UPI ID or bank details if not already updated. Click on “NEXT” to initiate a request. Bitbns system will find the depositor who will fulfill withdrawal request. Now there will be a few scenarios. It will show “Allocating peer” if not allocated, or show “pending withdrawal” status until the allocated peer transfers the amount to your bank account. Once the depositor has deposited the amount, you will see reference number with transaction comments. Now as a withdrawer, you need to check your bank account with the given reference number for the credited amount. If found in place, the withdrawer should mark as ‘Yes’. In case of ‘No’, a dispute will arise which they have to resolve themselves or can escalate it to Bitbns. However, there are some Dos and Don’ts in peer-to-peer trading that you must follow to enjoy a frictionless experience. Use UPI for faster transactions. Submit reference number of transaction done as soon as possible. Confirm transaction receipt as soon as possible. Be humble and use polite words in remarks. Don’t use words like Bitcoin or drugs in comments. Make sure you check the rating of the person you are dealing with. Getting started on Bitbns is easy and straightforward. You just need to log in with your email ID and complete a KYC process by submitting your AADHAR card details and PAN details. 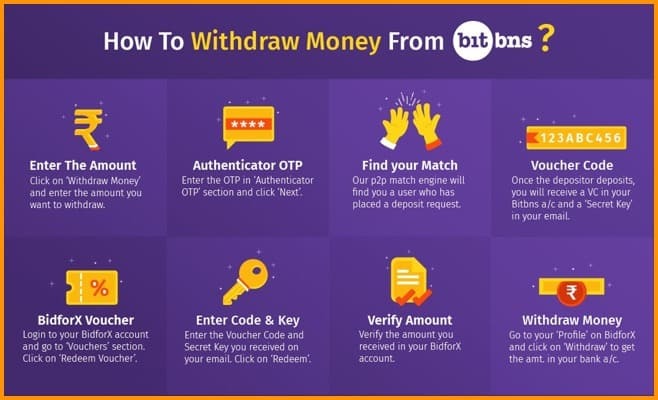 Post verification, you will be eligible to trade and deal with Bitbns. But if you wish to deal only in crypto, you can do so very well without going through the KYC process. Best Ways To Buy Bitcoins Without ID? Nice post, Bitbin will definitely boost the Indian community towards the crypto market, hope that the Indian government will take positive response against Banking ban.